Did you make any big transactions in Rhode Island? This morning I wake up to my dad screaming at me that there is a message on the machine that says that I need to call a number b/c someone was trying to use my card. Well personally I thought the way the message was that it sounded funny, so I went down to the bank. They had closed my card b/c someone tried to make a $500 purchase in Rhode Island. The girl asked me if I had been to Rhose Island lately. Uh yeah, busy college student, so that'd be a no. Well anyway I have to get a new card and I don't know what to do about cash until I get it. My mom went out to Sam's club today and brought back Shark Tale. We hadn't seem it and my mom thought it was cute. When I was messing around the features under subtitles there is a sign in the back that says "Toshi's". I laughed right away b/c that is the name of my betta fish Toshi. 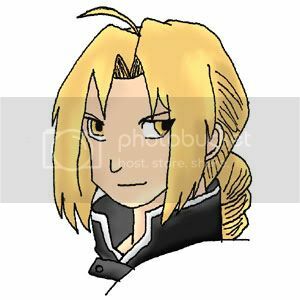 I decided I wanted to draw last night and drew Ed Elric from the anime FMA. It's not good, or original (I looked at another picture to do it) but it was my first time doing it so I'm pleased. Hehe, glad your bank caught that just in time. Do you remember when you lost your card? What's your bank? Mine's Bank of America (and a very good one too). I didn't loose my card, it was sitting in my wallet the whole time. Someone got my number somehow. The bank took my card to be shredded. Well, glad they caught it! That's scary, someone using your card or your name to buy a ridiculous amount of stuff. What happens to the $500? Will you get it back? And omg cute!Ed, you did a good job! They never actually got a hold of the $500 b/c my bank is that good. Thanks for the compliment ^_^.